I am, from time to time, doing posts I am calling Just One Thing. 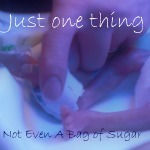 These posts are sourced from my huge community of parents who had had a baby in special care. I asked my community of parents to share just one piece of advice for parents bringing home their baby after days, weeks or months in hospital. When we came home, I found that Joseph's routine went to pot. His sleeping was erratic, his feeding was difficult, his weight gain was less than optimal. My one piece of advice is that now, 3 years on, I realise this is totally normal. Babies (and parents) become a bit insititutionalised, and once home things can go awry. My one piece of advice is to trust your instincts, and just give yourselves time to adjust. Remember they wouldnt be coming home if they weren't well enough, try not to freak out too much. After spending 102 days in NICU I was terrified but it was fine. Go for walks. You've been couped up for so long in hospital it will do you good to get some fresh air. Plus the fact that most units only allow grandparents as visitors to see baby, you can really show baby off and feel proud!! I loved it. I felt like the actress in a film "wish you were here". I would walk up the road thinking, "he's mine, all mine!! Take each day as it comes & try not to focus on what has happened before. Enjoy your baby been home & look forwards. Take time to just be with your baby. We made the mistake of letting the close family come round that first full day we were home. They were all so desperate to see her but I do regret it a bit. I think we should have had at least a couple of days to get used to just being the 3 of us first . Don't be afraid to ask for help. When James had been home a couple of weeks due to reflux and new enviroment I was running on no sleep and one day he screamed for hours got myself into a right state saying to him Im sorry for being such a bad mum and felt I couldnt look after him. Finally I decided to phone my mum who was up in a shot to help settle him down and let me sob to myself in the bedroom and get a couple of hours sleep in. As Paul worked 15 hour shifts back then i was doing it all myself most of the time and just having a close relative nearby just to come over even just for an hour to let you take a breather was a sanity saver. Make sure that you consider carefully who's help you accept taking baby home if you will struggle with transport. We had Father in law with us and it totally ruined it. He couldn't believe we had to put baby in a baby seat as surely she would have been safest in our arms (yes, seriously). He was grumpy and opinionated and that is what I remember about taking C home. I really regret letting him share in what should have been a precious moment as he did not deserve it or respect what a special time it was. Accept that its perfectly likely your baby may cry (and scream) for the first 24hrs they're home. So long as nothing is medically wrong, this is a normal part of the adjustment period particularly if they've been in hospital for long as it was the only environment they know. Try not to stress too much (you will anyway!) And consider spending the first day in one room to help them adjust gradually. Forget housework you need to concentrate on you and baby and if you do have visitors they should realise you have just bought home a very demanding little person that hardly lets you sleep so they shouldn't expect you to have a show home! Let others help you. Mine is strange, for me I had to take Harry out the first day he was at home or I was scared I would never leave the house. General advice for bringing any baby home - put a note on the door saying if you want visitors or not - some people just turn up!!! Limit visitors! You need time to settle in as a family without worrying whether you have enough milk for tea for guests & to be able to live in your pyjamas for a while. Relax, switch phones off and enjoy your baby. Take-away's can be your friend as can on-line food shopping. and remember that you can say no to visit requests, you dont have to see people if you dont want to. I think the overall theme here is to relax, to get to know your baby, and to take ownership back, limit your visitors, decide what works for you as a family. I think it's whatever works for you as a family. When K came home I kept the hospital routine going. I even kept a little notebook so I knew when she fed, how much, if she'd pooed, what her SATs were etc. It helped me and it certaily helped the midwife when she visited. We came home in September so I told everyone not to visit as she was still on O2 and didn't want to risk infection. I didn't take her out into public for a good few months but she did go outside in the garden. Probably seems OTT when I see it written down it worked for us. I felt comfortable and confident doing what I did. K is not my first baby so I didn't worry about many of the normal aspects of taking a first baby home. My piece of advice? Do what works for you and makes you feel comfortable. There isn't one right way.